Imagine a winter landscape: White birches reflect the December sun. Snow drifts around the bare trunks. A glaze of ice gives a silvery cast to evergreens. Such a scene was the inspiration for the topiary trees designed by the horticulture staff for this year’s Wonderland Express. 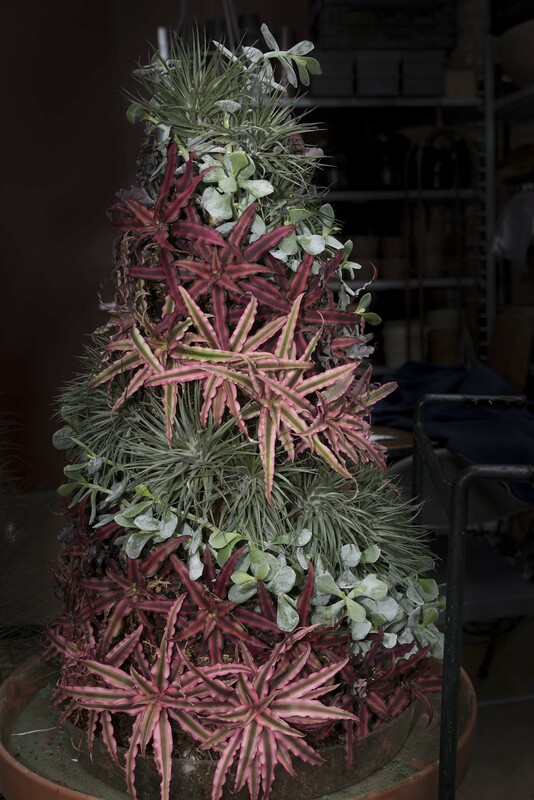 Tillandsia ‘Black Beauty’, Cryptanthus ‘Pink Starlight’ and ‘Ruby’, and the spoon-shaped succulent leaves of Cotyledon ‘Orbit’ make up this 3-foot topiary. The popular holiday event, with its indoor model train display and miniature replicas of Chicago-area landmarks, offers something for visitors of all ages and interests. The topiary room in Joutras Gallery recreates a winter scene from plants you don’t typically see in holiday arrangements. Drifts of white poinsettias resemble an undulating snowfall, and the frosty evergreens are constructed from hundreds of diverse air plants and succulents. The result is an unusual horticultural presentation that feels both wintry and alive. The display may also give visitors ideas for incorporating different types of plants into their home holiday décor. 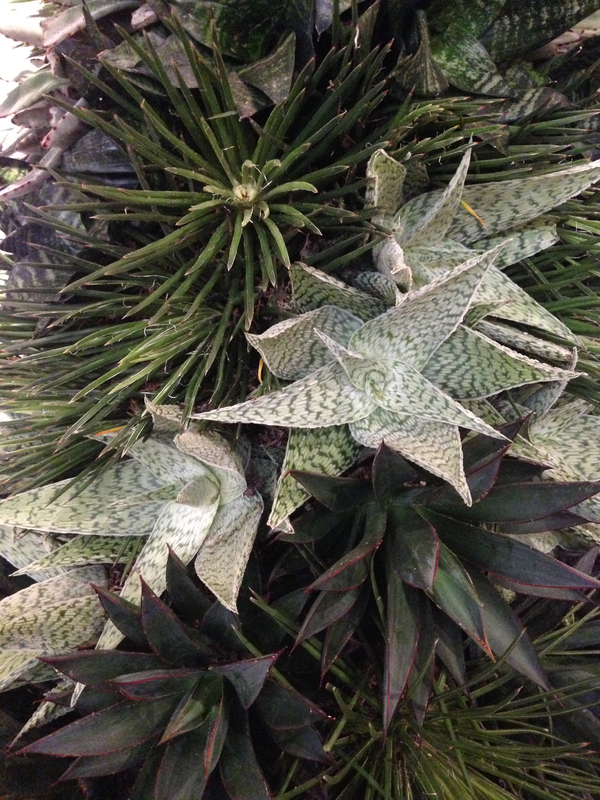 Hens and chicks, Tillandsia, aloe, mother-in-law tongue, and agave can all be incorporated into beautiful arrangements to last all winter. Construction of a basic topiary tree is relatively simple, and gardeners looking for an indoor project might consider creating a tabletop topiary for their home. Bags of styrofoam peanuts fill the tree frame, covered by a layer of sphagnum moss. You’ll want gloves for the moss—it can be pointy, and a skin irritant. Stuff it! We started by stuffing cone-shaped frames with bags of styrofoam peanuts. The bags have some give and are relatively lightweight, yet help anchor the plants used to cover the frame. The topiary forest in the Joutras Gallery has a central tree standing 8 feet tall, surrounded by six smaller trees. For the biggest trees we used Sansevieria trifasciata ‘Moonshine’, Sansevieria parva, Cryptanthus fosterianus ‘Elaine’, and Euphorbia stenoclada. A tabletop tree for the home could stand 12 to18 inches tall, and be composed of more delicate air plants (Tillandsia). It’s a wrap! We took fishing line and wound it around the frame to create a grid for extra support. Gather moss. Next, we covered the frame with handfuls of sphagnum moss. The moss medium holds moisture needed to keep the plants healthy and happy. If you’re trying this at home, it’s a good idea to wear plastic gloves when handling the moss. You can also use floral oasis foam cut to shape as an alternative to the frame and moss. Insert plants. We used floral wire and sod staples to poke plants through the moss and into the Styrofoam. For smaller plants, such as the Tillandsia, wrap the wire in an inconspicuous place at the base of the plant, and twist the ends into a pick. 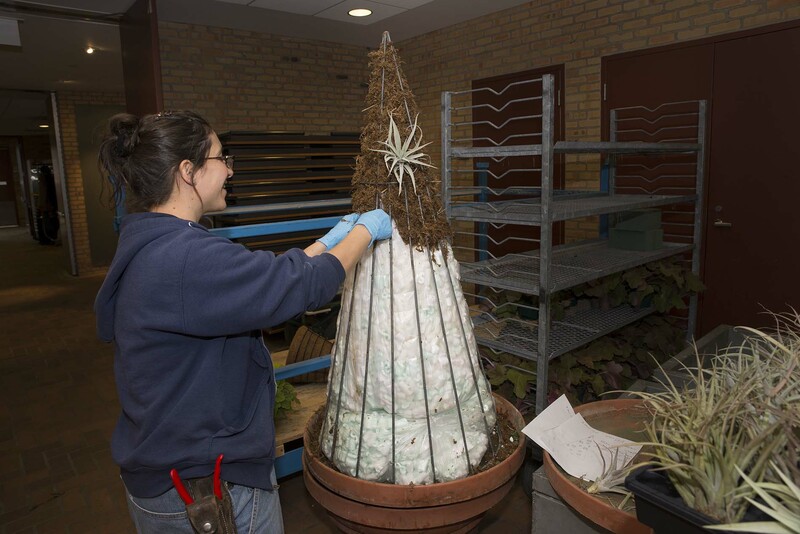 Larger plants are held in place with the staples inserted at an angle and hidden by the foliage. Start at either the top or the bottom and work in one direction. Plants should be touching, but not completely overlapping. Place a few plants, step back and look at your work. Your eye will tell you if the plants are too sparse, overcrowded or just right. Spanish moss can help fill in any remaining gaps. Have fun! Topiary trees allow you to be creative with live plants, and make something really special for your home. The arrangements can last for months if you spritz them with water, and protect them from light and temperature extremes. The jagged white and green stripes of Aloe ‘Delta lights’ contrast with thin-leaved Agave gemniflora and a purple-edged Agave ‘Blue Glow’.